Vital Tea Lounge opened in June in Seattle's International District/Chinatown. 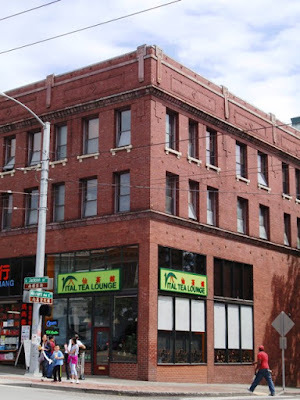 Located on the corner of South Jackson Street and Maynard Avenue South, this is the third branch of Vital Tea in Seattle and the first to offer a tea room setting. 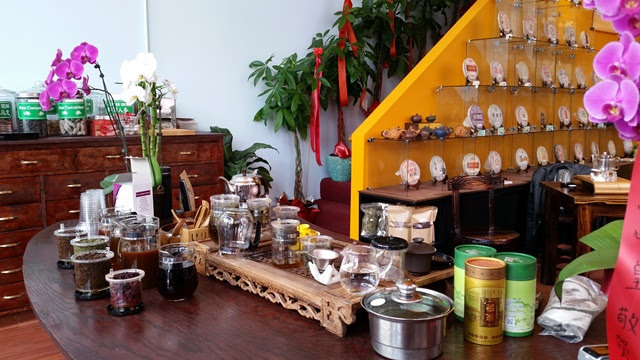 Upon entering the tea lounge, visitors are warmly greeted and may enjoy a complimentary tea tasting at the tea bar. 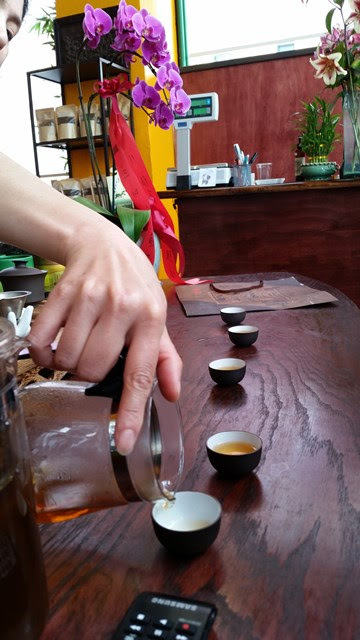 My visit began with a sample of Lychee Black Tea. Beyond the tea bar is the lounge area and retail space where teaware and a selection of teas including green tea, white tea, oolong, black tea, puerh, herbals, and tisanes are available for purchase. 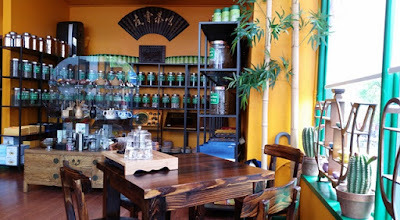 Guests who would like to stay and enjoy a pot (or more) of tea will be guided to one of three tables on the main floor. Though the room is small, it flows well, has plenty of natural light, and doesn't feel crowded. Rather than charge by the pot, Vital Tea Lounge utilizes a table fee system. For each 4-person table, there is a fee of $15 for the first 1-2 guests with a $3 fee for each additional guest. 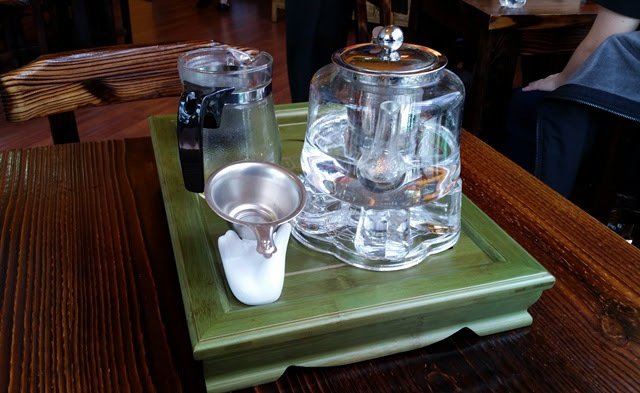 Each table holds a tea tray, a pot of hot water on a warmer, a filter, and a teapot. 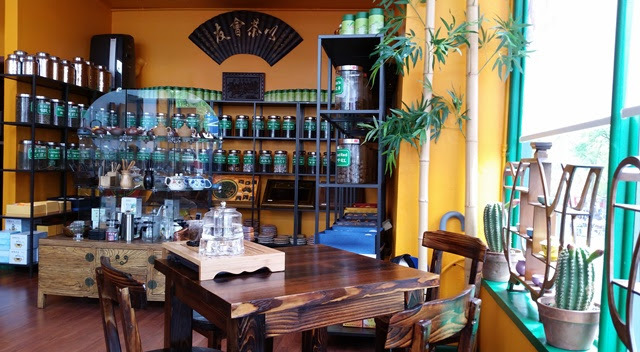 Once you've selected your tea from the menu, it will be delivered in a specialized brewer or you may request a gaiwan. The brewer is placed over the teapot and hot water is added. 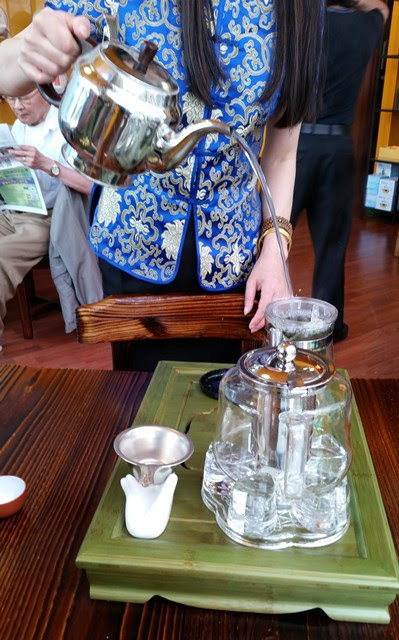 When the tea is fully infused, usually in less than a minute, a button is pressed to decant the tea into the teapot, leaving the infused leaves in the brewer. The result is a full-bodied gongfu-style tea. Service is attentive and fresh leaves and water refills will be provided over the duration of your visit. 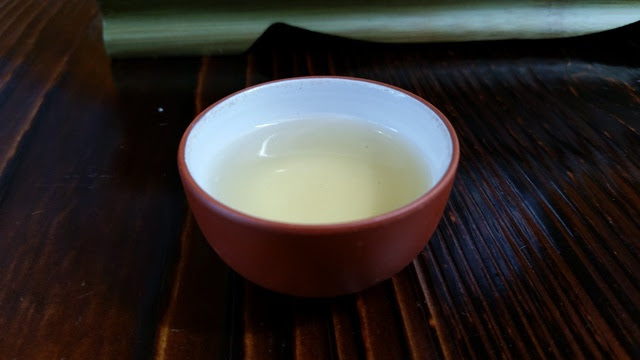 For this visit, my friend and I selected Blue People Ginseng Oolong which is always a treat. Since this particular oolong is spent after the first few infusions, fresh leaves were provided promptly. To conclude our visit. we were treated to a complimentary pot of Lychee Black Tea. In addition to seating on the main floor, there are more tables for overflow in the loft upstairs, as well as two private tea rooms upstairs. 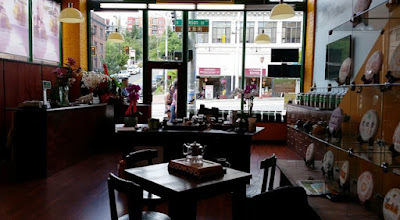 Private Tea Room I if available for $40 for 2 hours and can accommodate up to 6 guests. Private Tea room II is available for $60 for 2 hours and can accommodate up to 10 guests. Note: Table and private tea room prices were current as of July 2016 and may be subject to change over time.